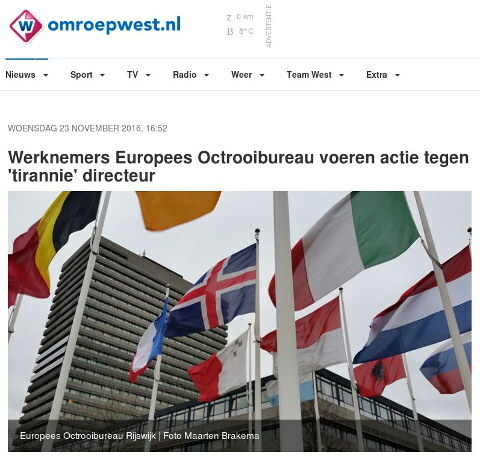 THE HAGUE – Employees of the European Patent Office (EPO) in Rijswijk will go campaigning against their director Benoît Battistelli on Thursday. Reported that the FNV. The demonstration is to start at 12:00 on Square 1813 in The Hague. The reason for the action is the poor relationship between the staff and director Battistelli. The situation at the EPO has long been troubled. Hundreds of people already made known their displeasure over the working atmosphere in April and January. The immediate reason for one of the demonstrations was then the dismissal of two colleagues and the demotion of a third. Again, the staff speaks of “tyranny” of the director. “Battistelli rules with an iron fist and tolerates no participation or contradiction. He dismisses people at will, demotes them, and unilaterally implements changes to working conditions and demotivates if the entire organization,” the FNV said. A spokesman for the EPO said in January that Battistelli is engaged in a major reorganization to modernize the organization. “That of course leads to a reaction by the staff. Everyone has difficulty with change. ” He denied that there is a culture of fear.